Approaches and entrance to Plymouth, and whole of the River Tamar. Scale: 1 : 20,480. Plans showing whole of River Yealm, headwaters of Rivers Tamar and Lynher, and Mayflower, Sutton harbour and Queen Anne's Battery marinas. 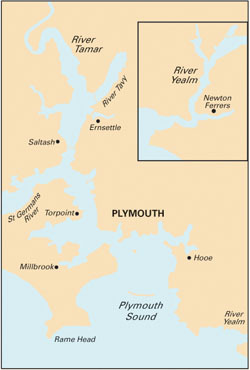 Larger scale inset Scale: 1 : 12.5000 of Plymouth inner harbour area. For this 2015 edition the chart has been fully updated using revised depths where applicable. King Point Marina is now displayed on the chart.